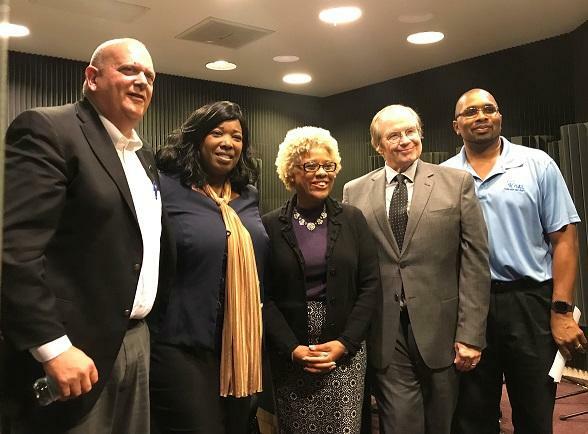 L-R: GAL Executive Director Alan Abramowitz, FAMU Prof. Ranata Hughes, FAMU Dean Michelle Ferrier of the School of Journalism and Graphic Communications, WFSU’s Tom Flanigan, GAL Director of Advocacy and Inclusion Calvin Martin. "If you look at the child welfare system from investigations of families to what happens next – whether they go to foster homes or are reunified or adopted – the further and deeper you go into the child welfare system, the more the disproportionate problem occurs," says Alan Abramowitz, executive director of the statewide GAL office. Minority children find foster and adoptive homes at lower rates, rack up more placements, and are likelier to be placed in a group home or age out of foster care without a forever family. Calvin Martin, GAL’s Director of Advocacy and Inclusion, says communities vary widely in responding to a call for volunteers - and many are mistrustful. “Sadly, sometimes those are communities of color due to some mistrust of the system itself as a whole," Martin says. "So we have to figure out a way to do specific types of engagement efforts, which is where I think this partnership comes into play." GAL is charged with representing the best interests of every child, "and so we wanted to take on the idea of implicit bias and take on these issues so we can make sure every child is taken care of,” Abramowitz says. Michelle Ferrier, who became dean of FAMU's School of Journalism and Graphic Communications last year, was receptive. She says that comes from seeing the challenges that young people out of foster care face in getting a higher education. "I think our students are of the age to understand not only the challenges that they face as students but the additional challenges that these students who are emancipated youth that come out of this program face in housing, in getting the support that they need, in getting the food that they need to be able to eat every day," Ferrier says. Ferrier also believes that helping GAL will hone her students' critical thinking skills. "We're giving our students the opportunity to take an obviously real-world problem and bringing to bear all the skills of our students in our journalism, PR program as well as in graphic communications, to try to develop messages and reach into those populations that have been hard to reach." This is the first semester of the partnership, and it's been devoted to research. In the fall, students will start cranking out public service announcements, graphics, and other recruiting materials. Click here to learn more about the GAL program, or call 1-866-341-1425. Children removed from their parents due to alleged abuse or neglect would have the right to have a lawyer under a measure before the Florida Constitution Revision Commission. Some worry that could do more harm than good.